I’ve kind of been on this kick to get rid of our standard household cleaners in favor of some greener, more natural options. This is really because H is so mobile, and touching, tasting, smelling, and seeing everything in sight. I started to become very aware of the number of chemicals she’s coming into direct contact with these days. Not that she’s drinking bleach from under the sink, but I wonder about the lingering residue and fumes in the air. The problem with green cleaners is they don’t always actually get things clean. This is a fundamental requirement of cleaners, especially with a toddler everywhere. And I know people swear by homemade vinegar solutions, but when I tried that I could not deal with the smelly aftermath. I’ve tried green products in the past and been pretty underwhelmed. But they’ve come a long way in recent years. 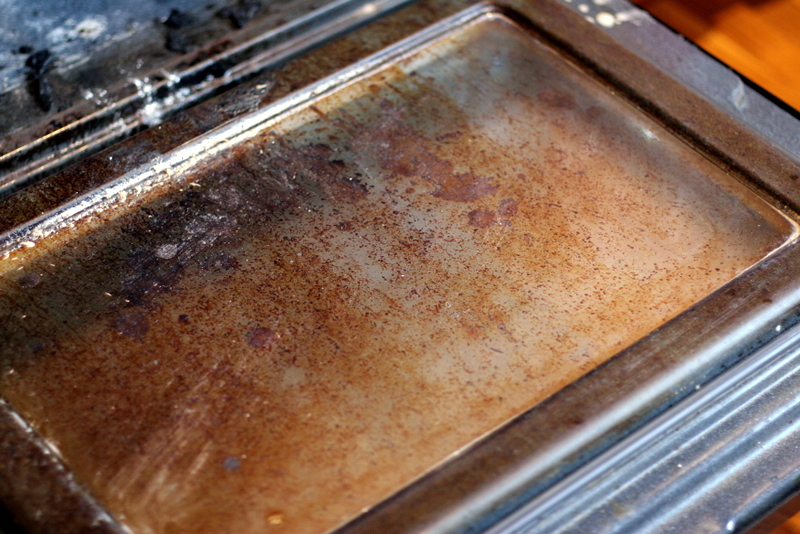 I decided that my diabolically filthy oven would be a good test of the power of the green clean. If a natural cleaner could conquer that, it could probably do anything. 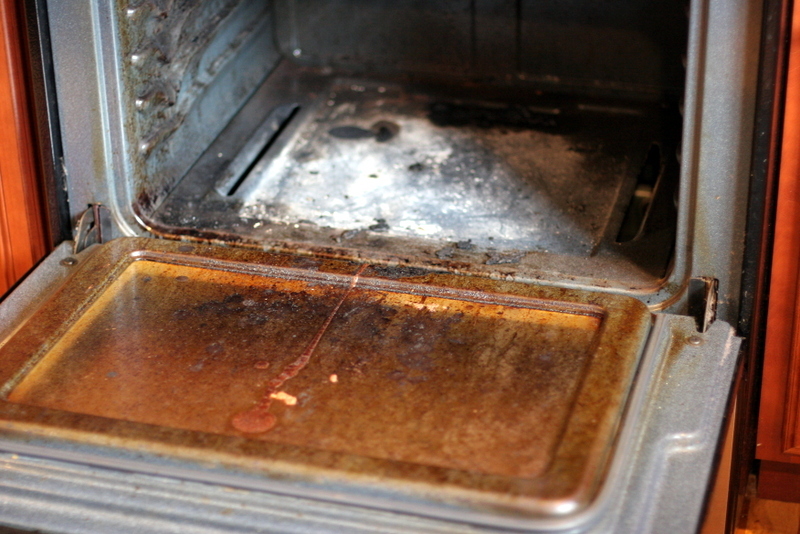 Let’s just say that in the 5+ years we have lived in this house with this oven, I’ve cleaned it exactly zero times. I mean, I’ve wiped up pie drippings and cheesy toppings from the oven floor, but I haven’t stuck my head in there to really scrub it into submission. Another reason for the green cleaners; I knew the job would take hours (4 solid scrubbing hours, in the end), and I did not want to inhale toxic fumes all day. My oven’s manual said to use soap and water and a non-abrasive scrubber, rinse with ammonia. 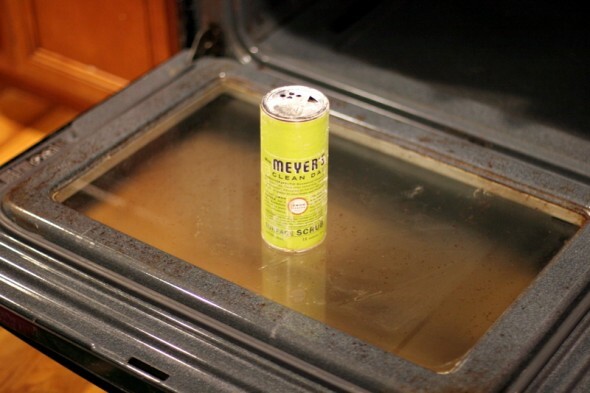 After some hysterical laughter over the heretofore unknown senses of humor and optimism of oven manual authors, I decided to first try just a spray cleaner, then two of my deep clean options. 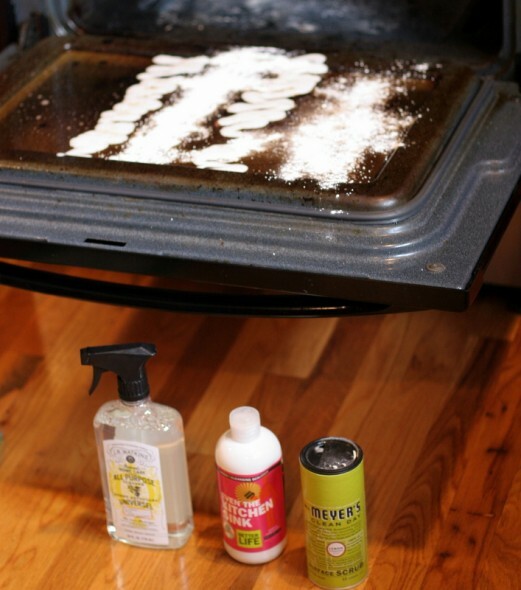 Again, I know folks swear by homemade concoctions of baking soda and vinegar…they just haven’t worked as well for me. 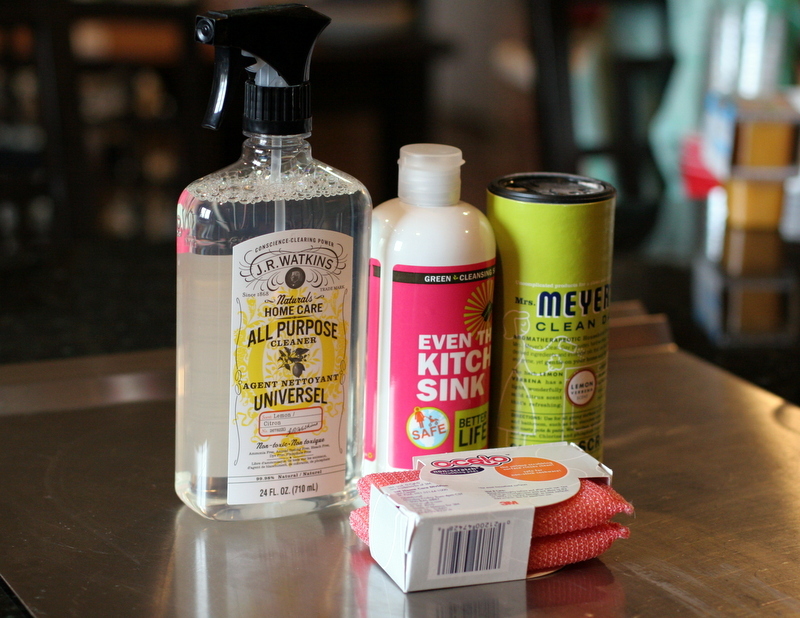 I used J.R. Watkins All Naturals spray cleaner, which I’d been using for everyday counter top wipe downs. Then I alternated drizzle/sprinkles of Better Life’s Even the Kitchen Sink gentle scrub and Mrs. Meyers Clean Day Surface Scrub powder. The full arsenal. I bought everything at Target and Whole Foods, rather than hunt down specialty cleaners by far-flung indie brands. The above left hand side, which was just the J.R. Watkins spray, clearly did nothing. Even the Kitchen Sink was okay, but the Mrs. Meyers Clean Day powder was the only product that started to lighten the mess on this door. So I abandoned the other 2 products and went to town on the oven with just the Mrs. Meyers stuff. So. Much. Better. I don’t think it’s possible to get it looking brand new, but this is pretty awesome. I used half the container of powder on the oven, and I did a lot of soaking, sprinkling, letting it sit, and coming back to scrub. Which required a tremendous amount of diluted ammonia solution to clean up. Rinse and repeat several times. It took all day to clean the oven. When I say 4 hours of cleaning, I mean 4 hours of scrubbing; that does not include the waiting while the cleaners tried to cut into all the gross. So I’m pretty happy with the Mrs. Meyers products, happy enough that I bought the spray cleaner as well (the J.R. Watkins spray was leaving my counters kind of sticky). I’ve been canning this week and making a royal mess, and I tried Even the Kitchen Sink and Mrs. Meyers scrub when I made a mess of the sink, too. Even the Kitchen Sink would be great for everyday, probably awesome to keep in our bathrooms, but again…Mrs. Meyers was clearly better at the sticky, greasy, caked on kitchen grime. Now, for counter tops I’m still not completely sold. The Mrs. Meyers spray cleaner is fine for regular counter wipe downs, and I do prefer it to the J.R. Watkins. I bought some vinegar-based all natural wipes, too–great for quick cleaning the baby’s high chair, even though the vinegar smell is not my favorite. But none of them could handle the kind of mess I make in the kitchen after a baking/canning marathon like the classic Clorox and Lysol cleaners. I’ve now found some great stuff for deep cleaning sinks and ovens, great stuff for lightweight counter top cleaning, but I have not found something that can easily get rid of sticky sauces and greasy butter. Maybe I just need to learn the art of patience and leave the sprays to sink into the goop for a minute. Or maybe I’ll have to keep the heavy duty stuff around for big jobs. Still working on that situation. Hi everyone! great post, enjoyed the tips and look forward to trying a few things myself 🙂 I’m currently on extended sick leave so I really want to give myself something to do – cleaning the house is well needed! I usualy use oven cleaner maidstone for my cooker, I’d recommend to anyone in the area, but for the DIY route you have some brilliant tips, thank you!